This Fauré Festival was arranged by Daniel Stepner of the Brandeis music faculty and first violinist of the Lydian Quartet. I don’t think there had been a comparable event in the Boston area since Harvard put on a similar one in 1944, at the behest of Nadia Boulanger, beloved pupil of Fauré at the Paris Conservatoire and herself a beloved teacher of many Americans, quite a few of whom are still around. The weekend occasion in Slosberg Auditorium reinforced the awareness that Fauré’s music is still relatively little-known in America generally, but better-known around here. The academic side began on Saturday afternoon with three papers, featuring two invited scholars and a Brandeis professor. Nicolas Southon, musicology PhD (Tours) and graduate of the Conservatoire who is currently a visiting Marie Curie Fellow in England, is editor-in-chief of a projected complete works of Fauré to be published by Bärenreiter; he presented a survey of “Fauré and His Historical Performers – Creation, Interpretation, Tradition,” with interesting photographs of the great performers who worked with Fauré, including Ysaÿe, Thibaud, Casals, Cortot, Marguerite Long, and several singers. Clémentine Fauré-Bellaïche (a distant relative of the composer), who teaches in the Brandeis French department, talked about the rhythm and sound quality of Verlaine’s poetry, which inspired so many of Fauré’s most famous songs. The third offering, “A Listener’s Guide to Fauré’s Late Chamber Music,” was by Carlo Caballero, visiting from UColorado-Boulder and author of a major study, Fauré and French Musical Aesthetics (2001, Cambridge). The discussion that followed, before only a small audience, emphasized that Fauré’s works are the result of refined and sometimes rarefied taste; they have roots in a cosmopolitan style and yet they are totally French while still individualistic. Using measurements that are inevitably procrustean, one can identify elements of early and late style: early works that focus on piano music, songs, the Requiem, and the beloved Violin Sonata No. 1 and Piano Quartet No. 1, in which one can find parallels and influences from Chopin and Schumann and even Wagner; a middle period that includes the Verlaine cycle La bonne chanson (1894) and the incidental music to Pelléas et Mélisande (1899) and ends with Fauré’s appointment as director of the Conservatoire, in 1905; and a late period, in which Fauré grew almost totally deaf but produced an opera, Pénélope, and an eruption of chamber works, piano music, and songs of increasing chromatic complexity. The parallel with Beethoven’s career is tenuous, but it is there. The concert Saturday evening featured the Brandeis-Wellesley Orchestra, directed by Neal Hampton, and the Brandeis University Chamber Choir, conducted by Robert Duff. It began with a very slow, expressive reading of the Élégie for cello and orchestra; the solo was beautifully played by Jacob MacKay ’16. The Masques et Bergamasques, from 1919, followed; this is Fauré in a neoclassical mood, as though remembering comparable attitudes of his teacher Saint-Saëns. There are four movements, the first three of which were expanded from fragments of unpublished earlier pieces; the fourth, “Pastorale,” was newly composed for the set, and I could detect in it an elegiac flavor, remembering that Debussy, Fauré’s rival, colleague, and friend, had died the year before. The big item on the program was the best-known and most beloved of all Fauré’s works, the Requiem, of 1888— the third performance I have attended in less than a year. I had not realized all the details of its complex publication history. The performance used a new score carefully edited by John Rutter, with a chamber orchestra (this version was only recently discovered, its manuscript minutes away from being tossed into a dumpster without being identified) of just two horns, harp, organ, and strings (divided violas and cellos, basses, and only a solo violin added in the Sanctus and In Paradisum). The most familiar version is with full orchestra; I reported on the BU performance in Symphony Hall only a few weeks ago. I like this more intime version best of all, especially in the acoustical surroundings of Slosberg. The horns have more doubling of the choral parts in this version, and the solo violin sings in the upper octave. Dan Stepner was seated in the rear, behind the violas and next to the organ, but was prominently heard. Although the final “eis” of the Agnus Dei was so vanishingly soft I couldn’t hear it at all, the choral sound was lovely throughout. The soloists were very good, too: Sam Kreidenweis, baritone in the Hostias and the Libera me, and Lynnea Harding ’19 in the Pie Jesu. Sunday afternoon saw a roundtable moderated by Stepner, again with a small but alert audience. Much of the discussion had to do with publication history; it was pointed out that the first publisher of the Violin Sonata No. 1 was Breitkopf & Härtel (no French publisher was interested in chamber music in 1877, while Breitkopf, for its part, refused to grant royalties – French composers were unknown in Germany, after all, and the Franco-Prussian War was less than a decade past). Eventually Fauré was taken up by Hamelle, whose editors and engravers were not the best — though in his last years, Fauré went over to Durand, publishers of Debussy, Ravel and Dukas. Critical editions and oeuvres complètes comparable to those of Bach, Mozart, and Schubert were well-established in Germany but never in France until the Durand edition of Debussy, which is still under way. Such editions are esteemed, even demanded, by performers and musicologists but are never big moneymakers for the publishers (last I checked, the new score of Wagner’s Parsifal cost $600 for each one of its three acts). The evening concert included Fauré’s own arrangement of La bonne chanson for string quintet and piano. The Lydian Quartet (Stepner, Judith Eissenberg, Mark Berger, and Joshua Gordon) were augmented by Kate Foss, double bass; Donald Berman (whose Fauré solos I heard at the Longy School a few weeks ago) was the able pianist, and mezzo Lynn Torgove sang with fine musicality and expression—I had not heard her in French before. The concert began with Fauré’s only string quartet, op. 121, his last work, from 1924. The day before, we had seen a facsimile of the autograph score, complete in every note but without any expression marks or articulations; those were supplied for publication by Fauré’s pupil Roger-Ducasse. I felt that the three movements were uneven in quality, especially the final Allegro, in which the lack of textural variety was particularly noticeable, with everyone playing all the time. Many consider this to be Fauré’s most significant weakness as a composer; a regularly repeated texture doesn’t necessarily impede a short song, but can be dangerous in a work lasting many minutes (Schumann often has the same problem). But the first movement especially seemed to be beautifully proportioned, the textural weakness offset by remarkable harmonic imagination that was born in the isolation of deafness, like Beethoven’s. After intermission came the evening’s biggest piece, the Piano Quintet No. 2, Op. 115, of 1921—four movements of refined but strong harmonic imagination, with vivid sequences, passing intimations of whole-tone harmony, and abundant lyrical expression. The whirlwind piano writing of the Allegro vivo scherzo was breathtaking, but nicely contrasted with a finely expressive second theme. The Lydian Quartet was expertly paired with Ya-fei Chuang at the piano, for a thrilling performance in all meridians. Mention should be made of the handsome program booklet assembled by Stepner for the two-day occasion. 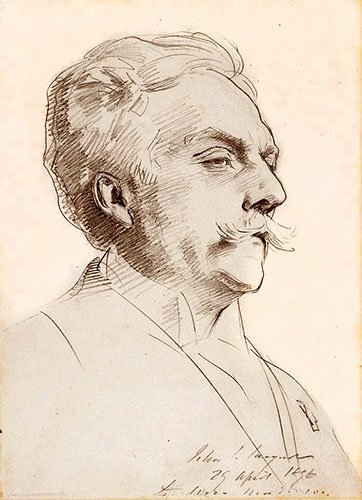 It included two pages of historical reflection by Carlo Caballero, half a dozen photographs including one of Fauré playing an antique lyre, Fauré’s own caricature of Verlaine (resembling Fu Manchu); and a pencil portrait of the composer by Sargent. Mark, Great article! I have been following your writings here for a while, now. Hope to see you!